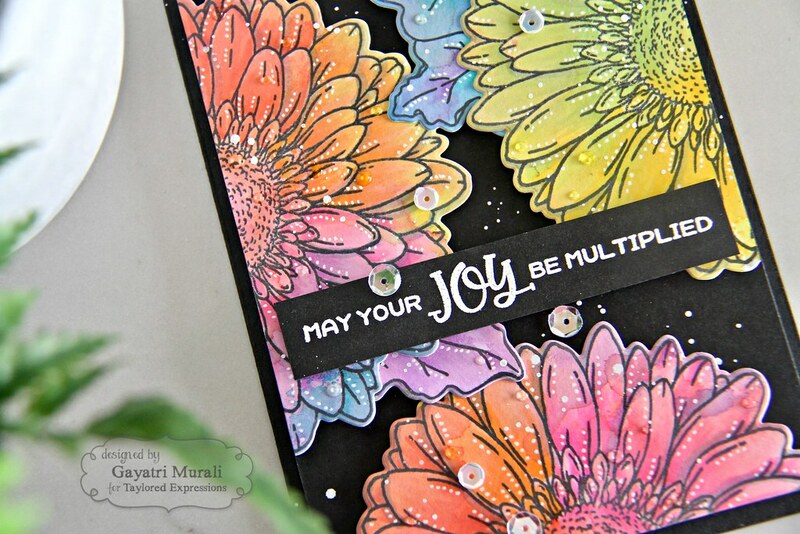 May Your Joy Be Multiplied! I used a large piece of Sugar Cube cardstock and did distress oxide ink smooshing in rainbow colours. I used bright colours like Candied Apple, Picked Raspberry, Spice Marmalade, Mustard Seed, Wilted Violet, Peacock Feather, Twisted Citron and Salty Ocean. I dried each layers before smooshing more. I repeated the process four times till I was happy with the result. I also spattered clean clear water and copic opaque white on the panel and left the panel to dry. Once dry, I stamped Big Blooms Daisy images on the panel. I used MISTI because the daisy image is large and I wanted even crisp image. I used TE Oreo ink and stamp atleast twice suing MISTI. 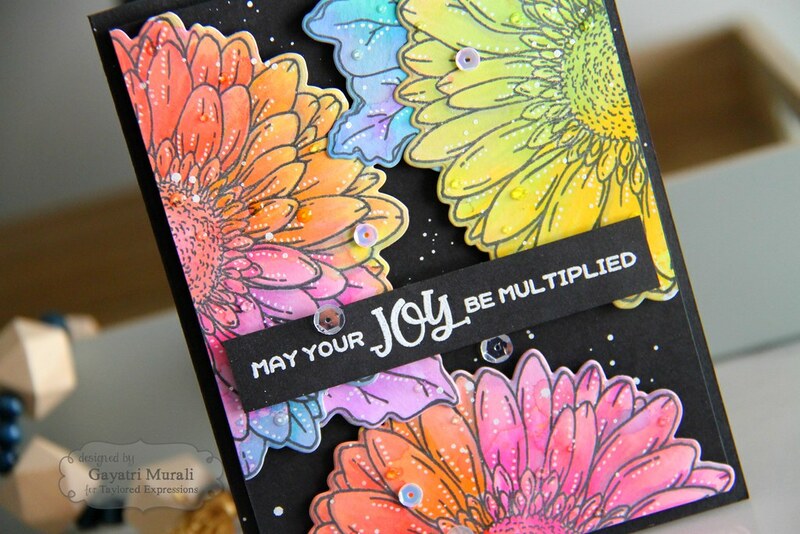 Then I used the new Big Blooms Daisy die to die cut the images out. On a 4″x5.25″ Oreo panel, I adhered the die cut daisy flowers and leaves using foam adhesives. I trimmed the excess off. This panel is adhered on Oreo card base suing foam adhesives. I then spattered more Copic Opaque white on the panel especially on the Oreo panel. 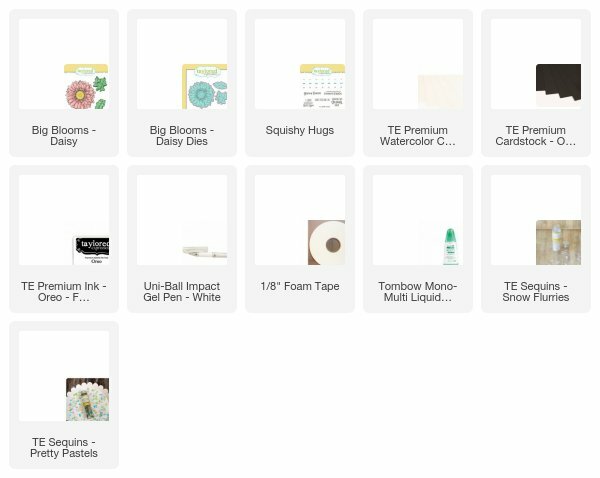 This will tie together the spatters on the flowers. The sentiment is from Squishy Hugs stamp set which I white heat embossed on a strip of Oreo cardstock and adhered on the bottom middle of the card front. Finally embellished with TE sequins. Love the contrast of colours against the black background. I now need to try this technique using alcohol inks background. I think hard and soft edges and layers of alcohol inks on florals will be amazing. These dies are available for purchase at TE store. 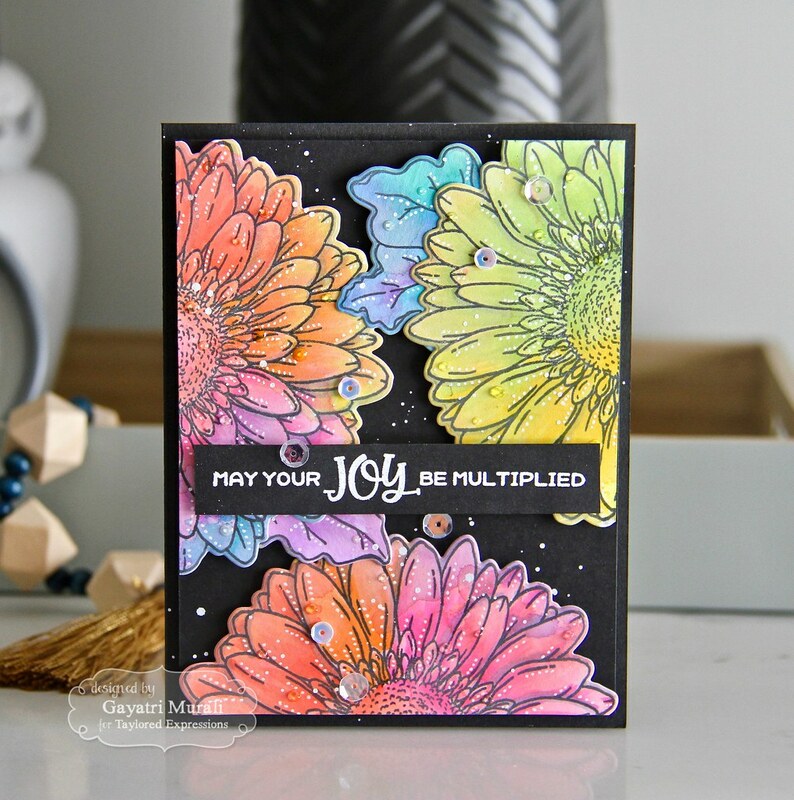 This is beautiful – really like the color extended beyond the edge of the flower since you used the dies to cut it out. The black is dramatic and makes the flowers stand out even more – love the white doodles and the sentiment is just wonderful.